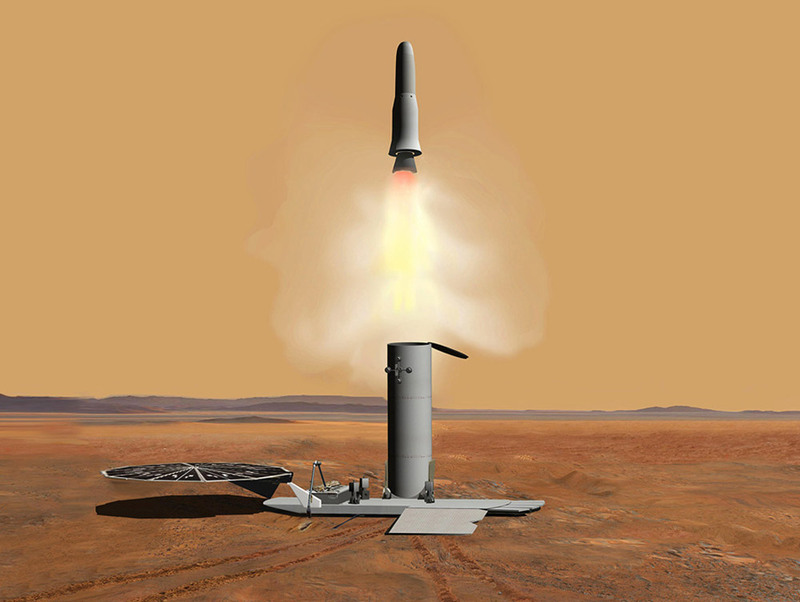 A hybrid propulsion system is being considered for a conceptual Mars Ascent Vehicle (MAV) due to its high performance and low Gross Lift Off Mass (GLOM). As part of a potential Mars Sample Return campaign, the MAV would be responsible for lifting Martian samples from the surface of Mars to orbit around Mars. A potential design for a MAV using a novel, high performance hybrid propellant combination will be presented. The hybrid option is uniquely suited for this application due to its favorable low temperature behavior, ability to shut down and restart (enabling a simple, single stage to orbit) and high performance. However, this option is at a relatively low level of maturity compared to conventional propulsion systems (e.g. solids and liquids). Therefore, recent technology development efforts will be discussed. Research and development accomplishments to date include: hot fire testing the propellant combination: a wax based fuel SP7 and Mixed Oxides of Nitrogen (MON) oxidizer, thermal cycling the fuel cores (aka fuel grains), investigating potential solid hypergolic additives to the fuel and chemical and mechanical analysis of the propellants. The goal of this effort is to increase the Technology Readiness Level (TRL) such that the hybrid option could be adopted for a flight mission in the future. Additionally, a flight of a technology demonstrator based on this design is currently in the planning phases and will be discussed briefly. 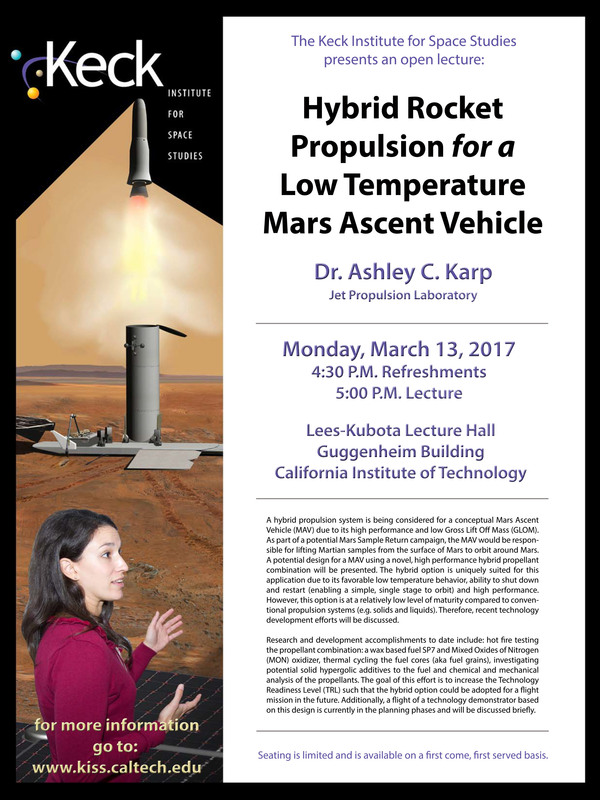 Dr. Ashley Karp is a propulsion engineer at the Jet Propulsion Laboratory. At JPL, Ashley has worked predominately on Mars missions/concepts. Ashley’s main focus is on Mars Ascent Vehicle propulsion concepts and technology development. She is the propulsion lead on the Mars Ascent Vehicle technology demonstrator and is the PI for JPL’s hybrid propulsion test facility. She has worked on Mars 2020, the Low Density Supersonic Decelerator, as well as many systems studies and technology development programs. Ashley is the Vice Chair of AIAA Hybrid Rocket Propulsion Technical Committee. Ashley received her Ph.D. in Aeronautics and Astronautics from Stanford University in 2012. Ashley also earned a M.S. in Aero/Astro from Stanford University in 2009 and a bachelor’s degree is from the UC Berkeley in Astrophysics, Physics and Political Science in 2005.